Mayor Bloomberg’s endorsement; the touch of death? Money can buy you a lot of things but apparently it can’t buy you love. Even after contributing $350,000 of his own money (by himself equaling the total of those in favor of recall) and using his MAIG henchmen to try and save Morse and Giron in their bid NOT to become the first politicians ever to be recalled from office in the state of Colorado, Bloomberg was getting no love from Angela Giron. Though I would argue that Bloomberg and MAIG understand anything I think Giron has a point. By failing to protect either of these seats, even though the money raised to protect them was 6 times the money raised to remove them, Bloomberg was exposed on several fronts. Gun Control is a loser plank to run on as it will inevitably come down to Pro Liberty or anti liberty. The latter being what gun control is really all about. Bloomberg and crew are pretty impotent on delivering. I mean, even though Giron’s district is overwhelmingly Democrat and Obama won it by 20 points last election, she lost by double digits in the recall. A mountain Democrat in Colorado is different from a city Democrat in the East Village. Bloomberg thinks his brand carries…he is mistaken. But Giron, even if she tries to backpedal on her statements now that she actually lost, was right. You can’t go around interfering in races, becoming part of what the opposition uses, putting your brand on the line and LOSE without cutting the legs out from under yourself. That is why Bloomberg may not find Virginia Gubernatorial Candidate Terry McAuliffe a welcoming supplicant for his endorsement. With polls showing the race anywhere from a toss-up to McAuliffe having an 8 point lead the interjection of the NY Nanny Tyrant may be exactly the boost McAuliffe’s opponent, Ken Cuccinelli. McAuliffe all ready refuses to answer questions about “assault” weapons bans (that he previous endorsed before running for governor) and only mentions background checks when cornered. While that may dupe some people into believing he is not a gun grabbing politician, the entering of Bloomberg and his circus on McAuliffe’s behalf will give him no room to maneuver around the point. 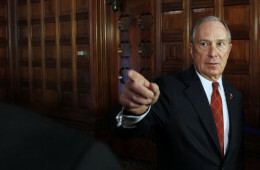 Bloomberg’s support has come with the stigma of radical gun grabber. And while that may play in a handful of states, it doesn’t play in Virginia. Yet somehow, drunk on their own kool-aid, MAIG will continue to force themselves into races in which they aren’t welcomed by those they endorse for some reasoning I don’t quite have the mental judo to comprehend. Huh? Message? The only message sent to Giron and Morse was that ignoring your constituency for too long makes you lose your job regardless of how much money Bloomberg spends to protect it. Bloomberg finds himself on a sinking ship from which his own members are jumping from (over 50 mayors have left since February) others are criminals themselves, he is impotent to positively impact a race for his endorsed candidate outside of heavily Blue states (and maybe not even then, ask Mayoral Candidate Quinn), and the people he does endorse call on him to perform seppuku for his failures. If that isn’t a recipe for Bloomberg’s endorsement to be a touch of death to any red or purple state politician I don’t know what is.